Over the past few years, online shopping has become the preferred method for most people to meet their holiday needs. From finding Christmas presents for the whole family to ordering decorations and even holiday meals, almost everything can be purchased online and delivered directly to your doorstep. While this new-aged convenience takes away most of the hassle of Christmas shopping, it does mean more work for the delivery companies. To combat the high volumes of delivery traffic, delivery companies take on additional workers to help out around the holiday season. With the increased number of delivery workers out during the holidays, a delivery worker accident is more likely to occur during this time of the year. UPS has hired nearly 100,000 holiday workers to combat the increased workflow; FedEx hired around 55,000 which is about 10% more than the previous year. Amazon has hired 100,000 seasonal workers as well. With the high increase in packages moving through distributions centers, increased traffic and dangerous road conditions, and greater expectations of getting orders out in time, you are more likely to experience a delivery worker accident. This is especially true when you consider that hundreds of thousands of inexperienced seasonal workers will be out delivering packages over the next few weeks. How Can You Prevent a Delivery Worker Accident on the Road? 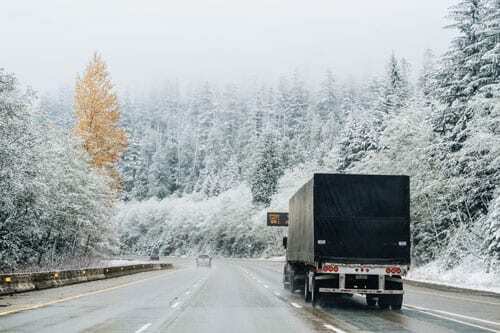 Be careful while traveling this season, especially in winter conditions. Delivery companies will be transporting millions of packages over the next few weeks. With the high volume of packages that have to be delivered, drivers may be rushed or overwhelmed. Be sure to be aware and alert of any delivery trucks on the road. Give trucks plenty of room, be prepared for incidents, and follow the general guidelines for truck accidents. Avoid driving when there is snow or ice on the roadway. Shovel your driveway so that trucks can easily access your house. How Can You Prevent a Delivery Worker Accident at Your Home? Slip & fall injuries are very common this time of year. If you are ordering packages to be delivered to your doorstep, make sure you have a safe pathway for the delivery workers to get to your door. If there is snow, shovel a path to your doorstep. If there is ice, put salt on your driveway and walkway. Not only do we want to avoid a slip & fall lawsuit, but we should also be concerned with the safety of the delivery workers who work so hard this time of year. How Can I Show Kindness to my Delivery Drivers? 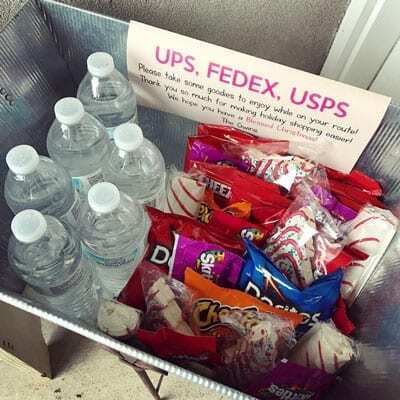 Consider doing something nice for your delivery drivers. Remember, most delivery workers do not get time off during the holidays like many other occupations. They are giving up time away from their families and friends to make sure that you get all of your Christmas gifts on time. A small act of kindness goes a long way. It doesn’t have to be anything big, maybe just leave out a basket of snacks or even a thank you note. "FedEx to Hire 55,000 Workers, Raise Hours for Holiday Season." Reuters, Thomson Reuters, 12 Sept. 2018, www.reuters.com/article/us-fedex-employment/fedex-to-hire-55000-workers-raise-hours-for-holiday-season-idUSKCN1LS1WU. Risley, James, et al. "Holiday Hires by the Numbers: Target Hiring the Most, but Amazon Pays Big." Digital Commerce 360, Digital Commerce 360 | Internet Retailer, 11 Oct. 2018, www.digitalcommerce360.com/2018/10/11/holiday-hiring-in-full-swing/. "UPS To Hire About 100,000 For Holiday Season." UPS Pressroom, United Parcel Service of America, 17 Sept. 2018, pressroom.ups.com/pressroom/ContentDetailsViewer.page?ConceptType=PressReleases&id=1537193052714-632.